It’s Day Fifteen of the Digest Diet, with six days to go. The needle has hovered at 203 for the last few days. (In a manner of speaking. I have a digital scale so of course there’s no needle; some visual memories just die hard.) I’m pleased to report, however, that this morning I dropped another half-pound, and have decided that even if I don’t meet my 15-pound weight loss goal, I’ll be satisfied to welcome a poundage report that does not begin with the number “2.” Can’t remember the last time I clocked in at under 200. And now I would like to say a word about fat. There are, as I’ve learned on this diet, good fats and bad fats. Examples of foods containing good fats are coconut milk, olive oil, salmon, and nuts, seeds, and nut butters—especially flax, walnut, and sunflower. There are also bad fats, and I love cooking and baking with one of them—namely, butter. I must admit that for the past 16 days, I haven’t missed butter at all. I will welcome its return (I’m an epicurean gourmet, after all), but I will be mindful of my intake. That’s one fat lesson learned. Now here’s another nugget from the Reader’s Digest Diet: Some foods are actually “fat releasers.” That is, they are rich in certain micro- and macronutrients that encourage weight loss. Vitamin C, calcium (including dairy sources of calcium), protein, reservatrol (found in red wine, red grapes, and peanuts), fiber, vinegar, quinoa, honey, and cocoa are all beneficial—and natural—elements in a weight-loss program. The salad I made the other evening and pictured above is a great example of a fat-releasing dish. I served this with broiled cod and steamed green beans and quite frankly it was all so filling that I couldn’t finish my allotted portions. I’m sharing the recipe for the salad and its accompanying vinaigrette here because it shocked me. How? Because its main ingredient is a green I previously disliked: arugula. I’ve never been a fan of bitter foods, and arugula is notorious for the bitter snap it leaves on the tongue. 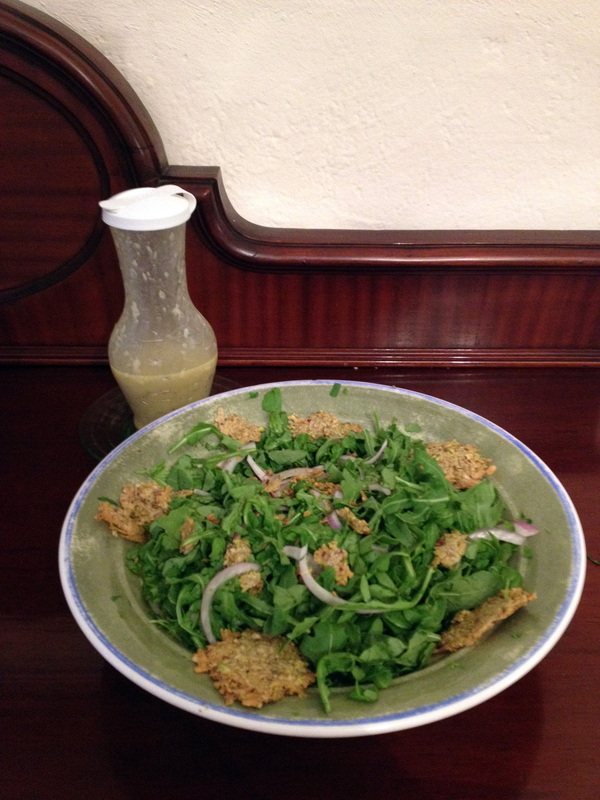 Something about the combination of watercress with the arugula, however, softened its bitterness. The fat releasers in this salad are the watercress, arugula, red onion, olive oil, lemon, Parmesan cheese, almonds, black pepper; in the vinaigrette, the troopers are the garlic, lemon juice, olive oil, and pepper. (By the way, I use freshly ground pepper. Forever and always.) I really liked this salad and will be glad to serve it long after I’ve passed the final day of the Digest Diet. I hope you’ll enjoy it, too! Preheat the oven to 375-degrees Fahrenheit. Line a baking sheet with parchment paper or a nonstick liner. In a small bowl, combine the Parmesan, almond meal, and pepper. Spoon 1-tablespoon mounds of the mixture onto the baking sheet, 4 inches apart. With the back of the measuring spoon (I found that using the heel of my hand worked better), gently press each into a round about 2-1/2 inches across (make sure there are no gaps in the mixture). Bake until turning golden all over, about 10 minutes. Let cool for 3 minutes on the baking sheet, then carefully transfer (they’re fragile) to a wire rack to cool. 1. Grate the garlic on a citrus zester into a small screw-top jar or any tight-sealing container. Add the juice or vinegar, mustard, herb (if using), and pepper. Shake well to combine. 2. Add the oil and shake to emulsify. If you have the time, let the dressing sit for a while so the garlic can flavor the oil. Store in the refrigerator. *I prepared this vinaigrette the first time it was a component of the diet, and I still have a fair amount left. Because I hate to waste food (and in order to save time), I used this version for the salad, herbs and all (I believe I added French tarragon), rather than make a new batch without herbs. Had I not already prepared this with lemon juice, however, I would have made a new batch. Copyright © 2012 The Reader’s Digest Association. Used with permission. The recipe looks fabulous! And,now I’m interested in reading about the diet! Diva, the diet is hands down the best I’ve ever tried. Scroll down the home page and you’ll find the complete series, beginning with “Buh-bye Cookie.” Really glad I’m doing this, and am happy to share the good news. Thanks so much for writing! You go, girl! Not only am I impressed with how much you’ve lost, but am impressed by your willingness to go public with the whole shebang. Lots of readers will find inspiration in your quest to shed pounds. Such a delicious quest you have here… I love reading this! Thanks so much for adding my post to your list of related recipes. So glad to have the added social media oomph for the Digest Diet. It’s amazing.